At the time of writing there are very few score sheets available to download from the Internet that are of suitable quality to print out and which are of a design that I like. So I have created my own that suit my requirements. 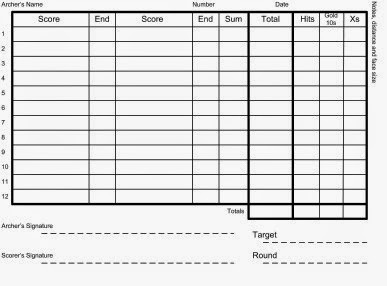 Generic score card suitable for both Imperial and Metric FITA style tournaments. 24 ends of up to 6 arrows per end, up to 12 dozen arrows. Download the high resolution version of the above image (use the download option on the linked page to get the best quality) and print 4 sheets to a page or save the original Visio 2002 version (240kb zip) and modify it for yourself. Tables of Imperial and Metric, Indoor and Outdoor target archery rounds. Single A4 sheet with all tables, folds down to A6 size (105x149mm) with one table per A6 side. Download the high resolution version of the above picture (use the download option on the linked page to get the best quality) and print from any graphics programme or save the original Visio 2002 version (330kB zip) for editing.